Palestinian Authority (PA) Chairman Mahmoud Abbas, while in Russia on Thursday, was reported to be signing a $1 billion natural gas project in Gaza with Russian Prime Minister Dmitry Medvedev. While exact details of the deal or start-dates for the project remain unclear, the Russian state news agency ITAR-TASS reported that Russia's natural gas giant Gazprom intends to produce 30 billion cubic meters of natural gas off the Gaza coast. Further, Russia's Technopromexport engineering firm appears to be pursuing an oil development project near Ramallah. 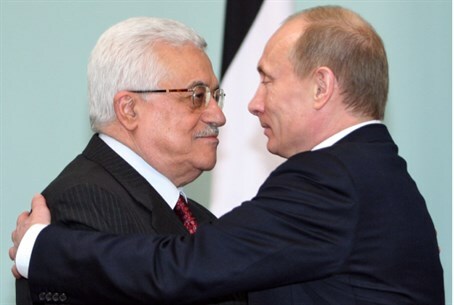 Russian President Vladimir Putin, who met with Abbas, said "relations between Russia and Palestine are based on a very solid historical foundation," adding "a lot needs to be done to develop the trade and economic relations between the two countries," reports Voice of Russia. Ties between the Palestinian Liberation Organization (PLO) and the Soviet Union began in 1970, when PLO leader Yasser Arafat visited Moscow. In 1988 the Soviet Union officially recognized "Palestine" as a state, following a proclamation at the Palestine National Council in Algeria that year. Abbas for his part said Russia is "a friendly nation for the Palestinian people and it has supported Palestinians in the time of trials. It has been supporting our struggle and our efforts to put an end to the occupation and to form an independent Palestinian state." On Friday, AFP reports, Abbas is set to meet Russian Foreign Minister Sergei Lavrov. After Lavrov visited Egypt last November, Russia signed a $4 billion arms deal with the Nile state, which was designed to specifically enable Egypt to at least achieve parity with the IDF. In terms of energy for the PA, a deal was signed two weeks ago by which Israel will supply the PA with gas for the next 20 years. The deal came despite the PA owing 820 million shekels ($235.2 million) to Israel for electricity by last June. That same month the PA was reported to be in a financial crisis, owing $4.2 billion in internal and external debt. The PA at the time was acquiring 95% of its electricity in Judea and Samaria and 75% of its electricity in Gaza from Israel.